Is there room for another annotation tool on your toolbar? WebNotes is an invitation-only beta designed to be a simple, trim research platform. The development has a couple of advantages that make it a viable competitor to Diigo and other annotation tools. Being narrowly focused on research, and emerging from basically an academic atmosphere, WebNotes might just have the “jump start” others have yet to take advantage of. WebNotes has invited SitePoint readers to their beta — follow the link at the end of this post to claim your invite. I consulted for Diigo last year, and consider it a great annotation tool. But, while Diigo, Fleck and a few others show promise, none has seen market-wide acceptance. Research is still largely about people applying personal methods (reading, writing, correlating) to the task. Relieving this pain point is what a research tool must do, and do well. The research process should ideally be done efficiency and accurately, this is where tools like Diigo and WebNotes should help. Adding social aspects or other features should be a secondary consideration. A superior tool that changes people’s habits, or engaging a focused niche are the only good approaches to this end. WebNotes, unlike Diigo now, is focused on this “tool” aspect. Over-engineering adjunct features, without producing a superb tool, is not simply a Diigo problem. 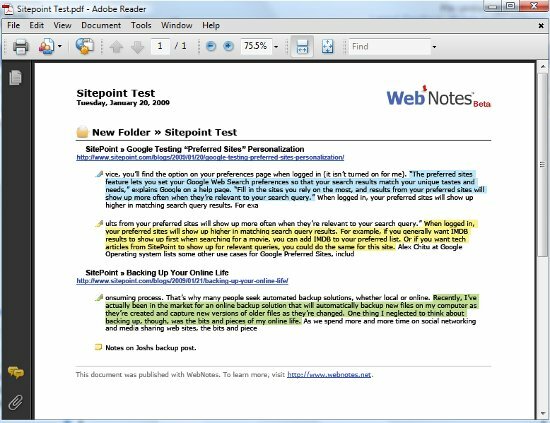 Adding sticky notes, sharing via email or permalink, and other useful tools help, but in practice, capturing the needed text, and putting it in condensed form is what a research helper should do first. WebNotes is like one of those ugly fat yellow pencils from grade school. When all the mechanical ones, the pens and the thin pretty ones fail or get lost, the old standby will write when you need it to. After organizing data via the sidebar tool, or on the user’s WebNotes workspace, publishing to PDF or HTML is a simple click away. As you can see from these images, this is not rocket science. It is just an elegantly simple tool to help gather and correlate data into versatile notes. Obviously not, unless WebNotes can capitalize on using their academic contacts to promote the “marginal” research tool I mentioned earlier. Clearly, starting from simple and building a very refined core tool will help attract a larger user base, but WebNote’s variant – though easy and effective – is decidedly not the “end all” needed to capture the research community. The problem for many startups is one of “paying the piper”, or having a model in place to viably monetize. WebNotes appears to be focused on premium paid services, which is smart given the niche user issues here. However, I do not think the current tool is of such a caliber yet, and even a very refined one will have to have fairly broad acceptance for it to be viable. Realistically, all of these tools are little more useful than copying and pasting annotations into a workspace or some other editor. In my opinion, without a “new age” interface, advanced editing, object oriented or other organizational aspects, and perhaps even more advanced “tool” capabilities, any annotation platform may be unmarketable. Get your red-hot WebNotes Tokens Here!